While I was discussing about the Sarawak Authentic Gift and Cuisines yesterday at the Kuching Food Critics Groups, I have found this interesting cuisine which was recommended by Wikitravel.org on Sarawak cuisine. This dish has caught my attention because no oil was used in the preparation. 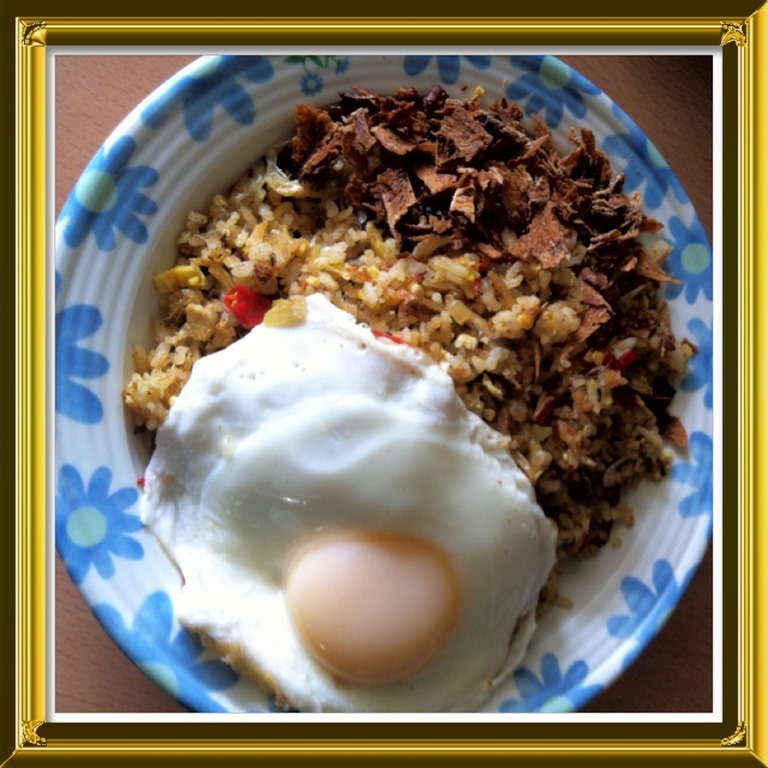 I remembered ever eaten this type of fried rice before but only yesterday, I know it is by the name of Nasi Aruk. I have try to search for the meaning of Aruk but to my disappointment, I can’t find any thing to explain the origin. It could have been originated from Indonesia. 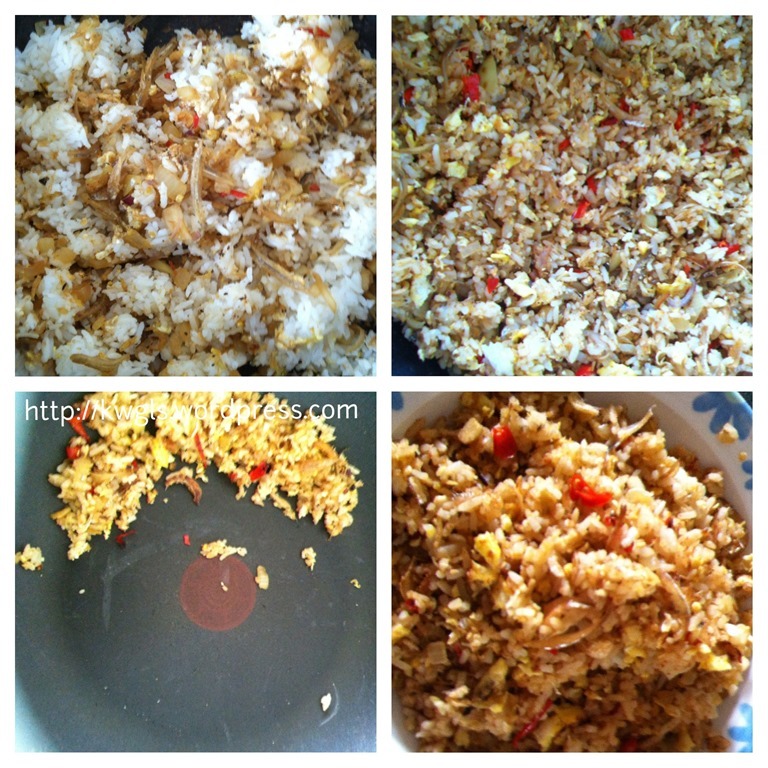 This simple fried rice is sort of commoner’s fried rice as none of the ingredients are expensive and costly. 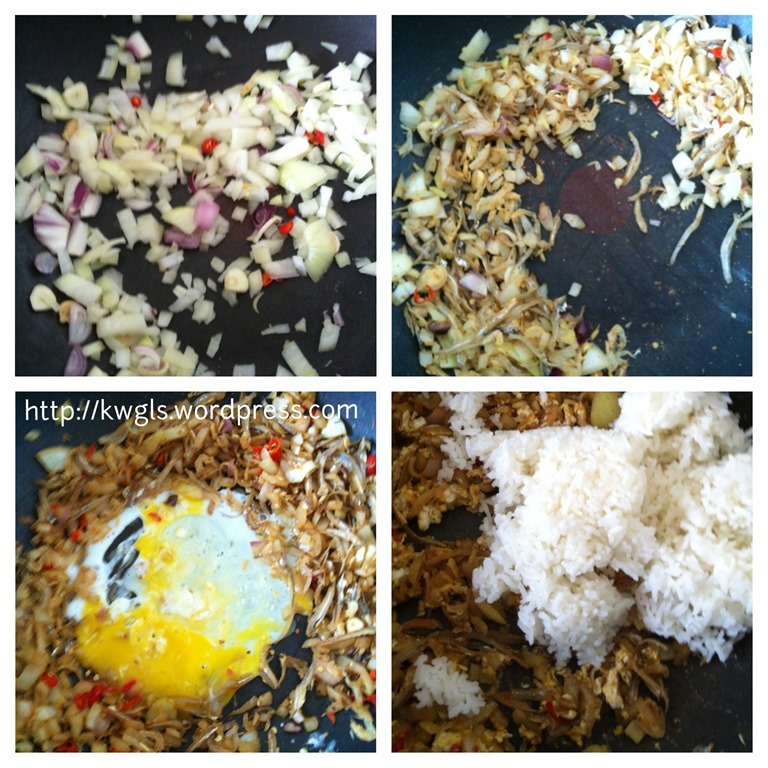 It is a special way of frying rice by the Malay families usually using left over rice from previous day. While it is considered as a commoner fried rice, it unique way of cooking have rendered it to be one of the authentic Sarawak cuisines and served at high class hotel and restaurants. A quick review of the ingredients and method of cooking will surely tell you that it is a healthy alternatives. It has minimum condiments, no oil, high minerals and vitamins and therefore top choice for a healthy diet. My kids are back to their hometown and only left with my wife and myself in the house. 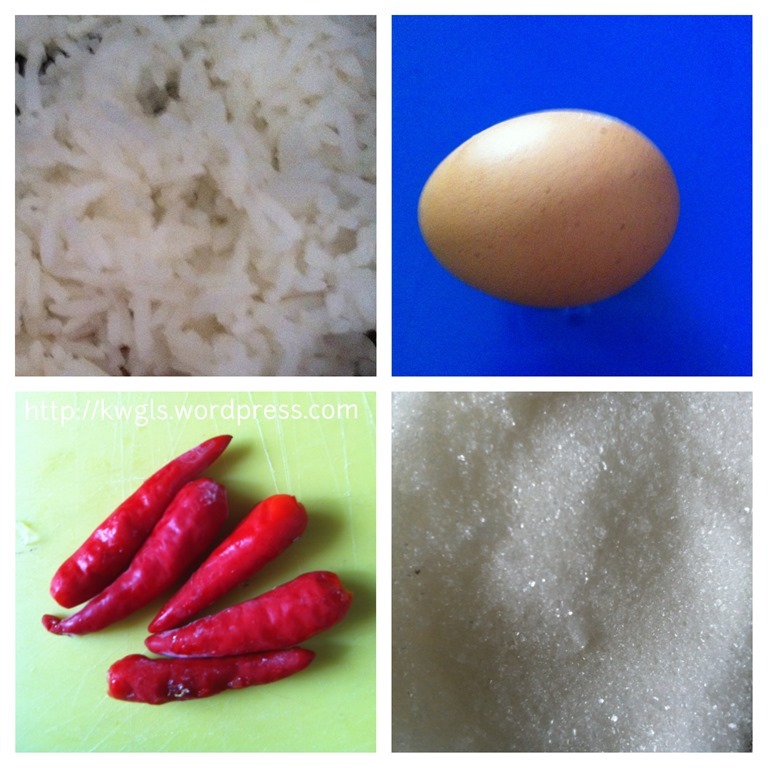 As I just want something simple but spicy, I have decided to prepare some Aruk fried rice for both of us. Some left over white rice (today I have cooked the rice specially for this which is not necessary at all. Left over white rice is easier to fry especially if you keep it in the fridge). 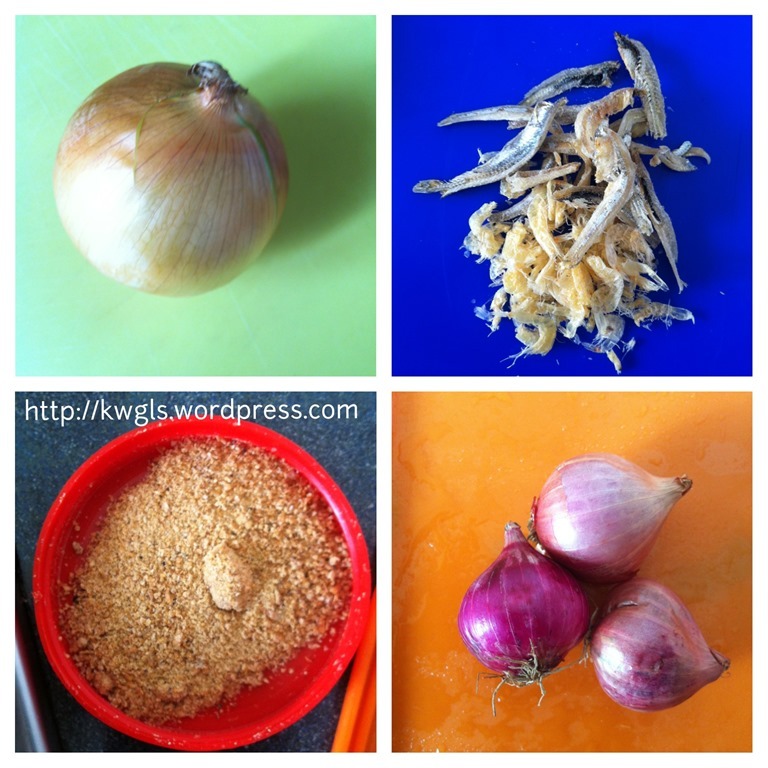 Some big onions and shallots – diced into small cubes. Some anchovies and dried baby shrimps – Traditionally, only anchovies (ikan billis) were used but since I have a lot of these baby shrimps, I have decided to throw some in. Some belachan (shrimp paste) – I have some belachan powder with me so use the powder instead of belachan chunks. Washed the anchovies and baby shrimps quickly with water and put them in the pan and continue frying until they are crispy. Make a whole in the center, crack your eggs and let the eggs dried up. Break the eggs using the frying utensils into small chunks. Add in the white rice and continue frying until well mixed. Add in belachan powder and condiments like light soya sauce or sugar or dark soya sauce or salt to taste. Stir until well mixed. Let it sit in the pan for a while to let the moisture dries up and get slightly burnt (if you want some Smokey or burnt flavor but you have to closely monitor this). Scope up the rice to serve when hot. In the third picture, I have purposely left some rice in the frying pan to show readers that the pan is very clean and nothing stick to it. Since I did use any oil for the frying the rice, I have decided not to use any oil to fry the egg either. Heat up the frying pan and crack an egg. Add in some water to the side and cover your frying pan for 1-2 minutes or until the water dries up. Scope up the egg and serve. If you are using medium heat to heat the pan, you can continue heating it after you add the water until all the water evaporated. If you are using high heat, you have to act faster and off the heat immediately to avoid your egg being burnt. The water added should not be too much, just a bit and add it as far from the egg as possible. It is ok if the water touch the egg. In the first picture, you can see that right side of egg have more bubbles and right side of eggs have less. This is because I have added the water too early and the water mixed with the egg whites which have yet to solidify. On the right sides, I have added the water only when the egg white start to harden. So you should have to ensure that the whites are harden before you add the water and it should be added gently. The steam will cooked the upper most layer of the yolk and therefore the egg yolk would flow out. 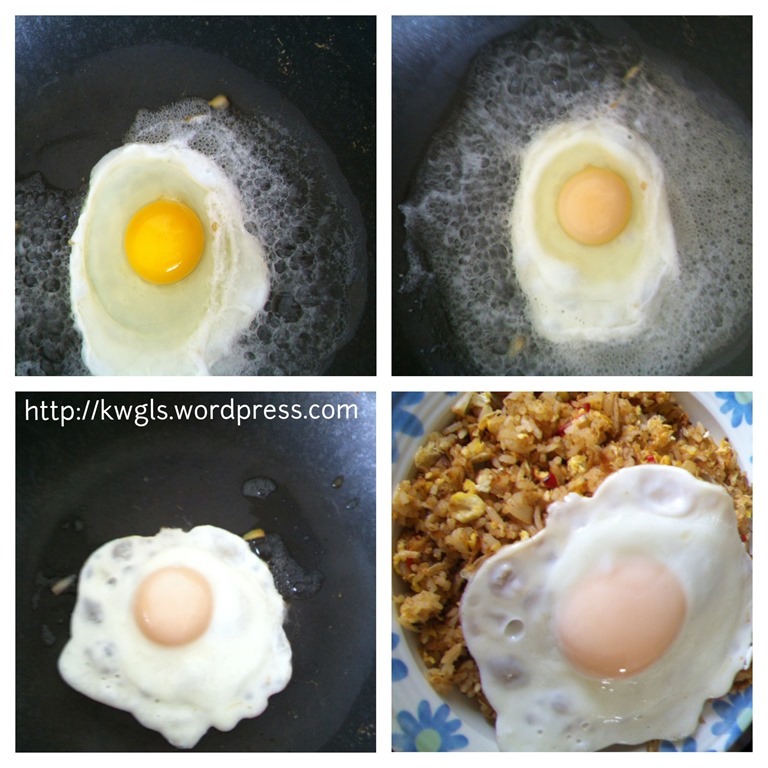 This is the fried rice with the fried egg (egg is optional). The taste is slight burnt, spicy and full of onion and anchovies fragrance. It was fabulous. Look at top part of the rice. It is some sort of dried squid delicacies that was left over from the Chinese New Year. I have “re-bake it” make it crispy and add it to the rice. At time, this fried rice is serve with sliced cucumbers or other garnishing ingredients like Chinese celery or spring onion. As no oil is involved and using the dry frying method, the fried rice will be slightly dry and you have to eat it slowly and best with some drinks. The fact that it is dry and cannot be eaten faster is not necessary a disadvantage and it can be construed as an advantage. Your body needs time to receive the signal for food that downed to your throat. “Dry” means you need to chew slowly and you will eat less as compared when it is watery and moist. As a result, you will feel full faster and that will aid in one’s weights management program. Basic ingredients means that the fried rice is good for those who is cost conscious and time of preparation are very short. Not all meals need to be elaborated. At times, simple meal is desired and is it not SIMPLE IS ELEGANT? 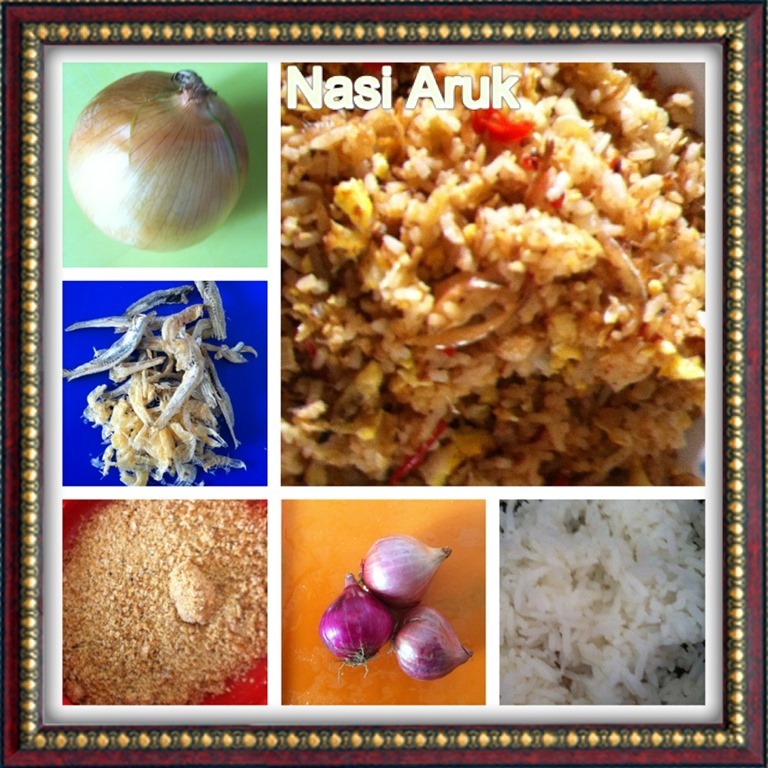 This entry was posted in Dish, Food Preparation Series and tagged 8, anchovies, Aruk, cuisine, food, fried rice, Goreng, ikan billis, ingredients, Malay, Mamak, menu, Nasi, Nasik, perfection, postaday, rice, sarawak, Sarawakian. Bookmark the permalink. I know this is belated but just to let you know..
Aruk in local Sarawak Malay dialect means frying without oil. Nasik aruk is fried rice with no oil, like you know. When my mom asked me to aruk peanuts for kuah kacang / sambal satey, she means to fry peanuts in wok without oil. If I ever try to goreng the peanuts – frying in oil – I’ll surely get scolded.